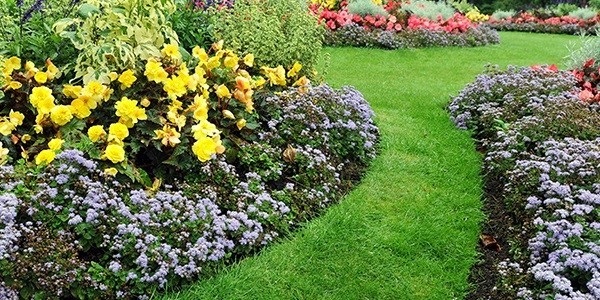 Beautiful looking flower beds can be the envy of any neighborhood. 1. Don’t be shy, go big! Your gorgeous flowers are going to need room to grow, so don’t underestimate the size of the bed you’ll need when you establish the borders. Your beds should be at least 4’ wide at their narrowest point. You’ll be happy you have the space when your blooms come in. 2. Raise ‘em up! Make sure you raise your beds and have at least 10” of good, rich topsoil before planting. It might be a pain to get all of that soil in place, but when you’re talking about flowers, soil is not the item you want to skimp on. 3. Think Ahead! When you are planting your flowers consider how much room they’ll need when they grow to be mature plants. This is especially important if you’re planting perennials in your flower bed. It’s not enough to just think about the space they’ll need this year—what will your flowers need in five years? Planning for that kind of growth now will save you time and energy in the years to come.